Whether in the country or in the city: For many homeowners, living in harmony with nature is the criterion for high quality of life. The combination of inside and outside, of living spaces and garden, expands the environment and conveys a very special lifestyle. Even on cold and rainy days. Provided the implementation is correct. 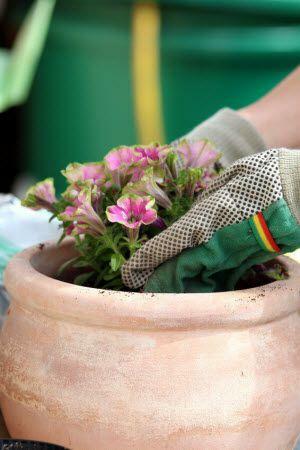 Winter is the ideal time for garden planning. If you want to be happy all your life, create a garden. Why is garden planning an absolute must? There are so many types of gardens - from vegetable gardens and ornamental gardens to classic hybrid forms and close-to-nature gardens. 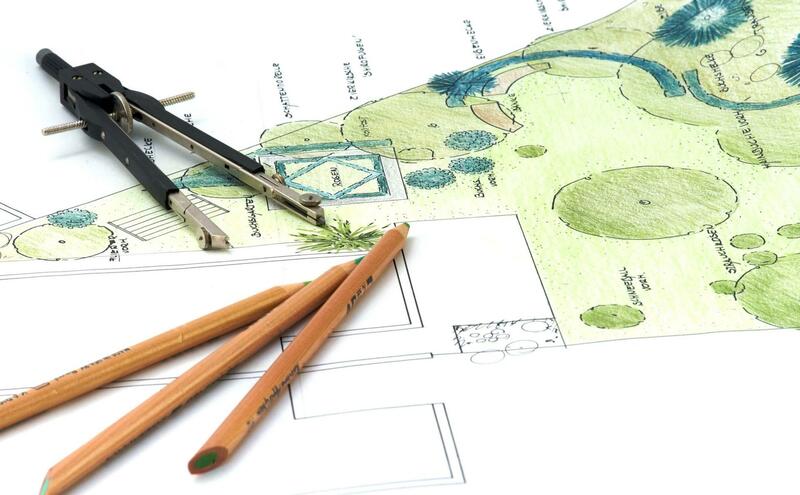 No matter whether you are planning to build your own garden or want to improve an existing one: Before you start planning your garden, it is essential that you know exactly what you want. Would you like to create a purely recreational oasis or do you appreciate fruit and vegetables from your own crops? Would you like a sun patio for an early breakfast, a shady garden seating area for sitting, a barbecue patio for the evening? Or would you prefer a so-called summer garden - open, flooded with light and yet protected from the sun, with flexibly adjustable glass side walls to keep out the wind and weather? Open space designs provide wonderful opportunities, but are complex and best handled by professionals. During the Winter, when the construction sites are closed, they have the necessary time to spend with you. Gardens are dynamic, ever-changing with the seasons and over the years. Experts are aware of this, deal with important factors such as the course of the sun, microclimate and ground conditions while paying attention to your personal preferences at the same time. And experts don't leave you standing in the rain in terms of building permits, floor space or clearances. Solid planning provides your property with a basic structure that also allows changes in use over the long term. Because good planning leads into the future. What is a sandbox today may transform into small garden pond or pavilion tomorrow. Of course, these specialists also take care of topics such as drainage and irrigation. By the way: When planning your garden, think of a sensible path system that combines all areas. A central point that connects the inside with the outside, so that you can really use your outdoor area as an extended living room. As a classic combination of house and garden, a patio should reflect the style of your house and garden while meeting functional requirements. We recommend that you plan for sufficient space. If your seating space is too small, your frustration will be all the greater if furniture blocks your path or if you bump into something with the slightest movement. Our tip when planning your patio: Before you determine the final location and size, simply sit in your chosen spot and try it out. 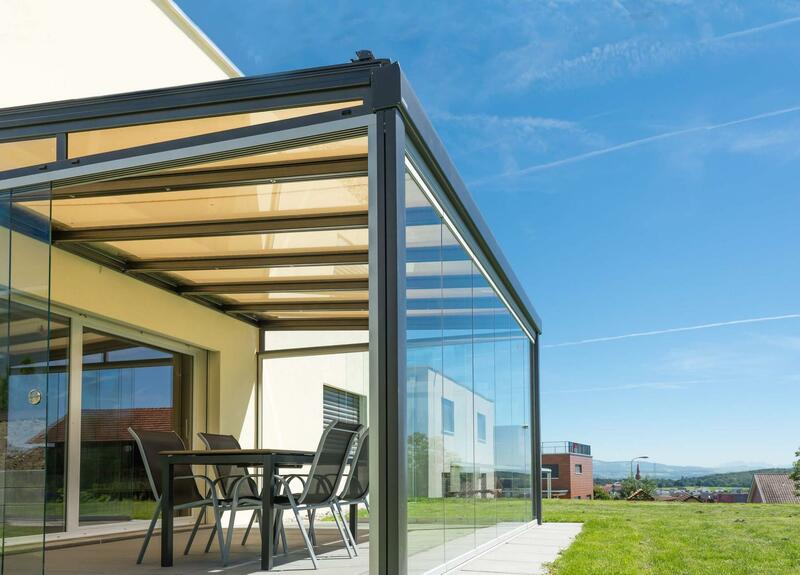 This allows you not only to define your space requirements, but also incorporate details such as shading, wind and weather protection through awnings or glass roof systems into the planning. Even on cloudy, rainy days, balconies and patios are the best places to catch a breath of fresh air. 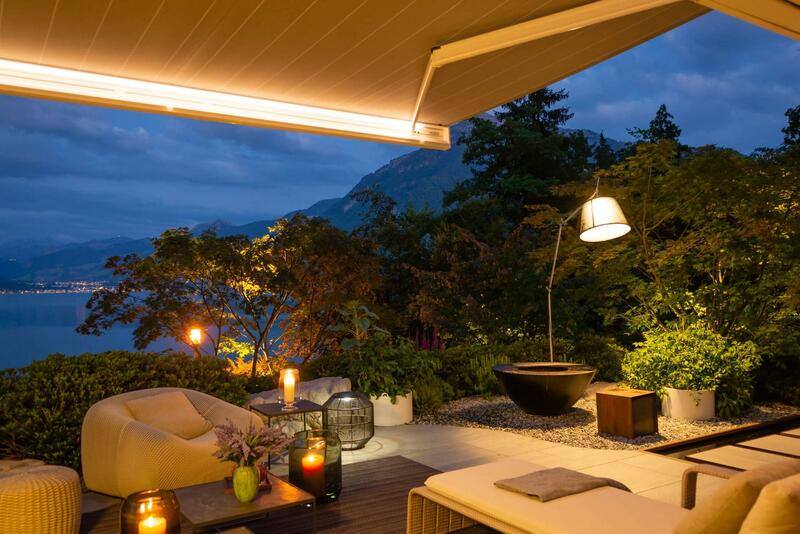 A stable, waterproof awning protects against Fall rain. 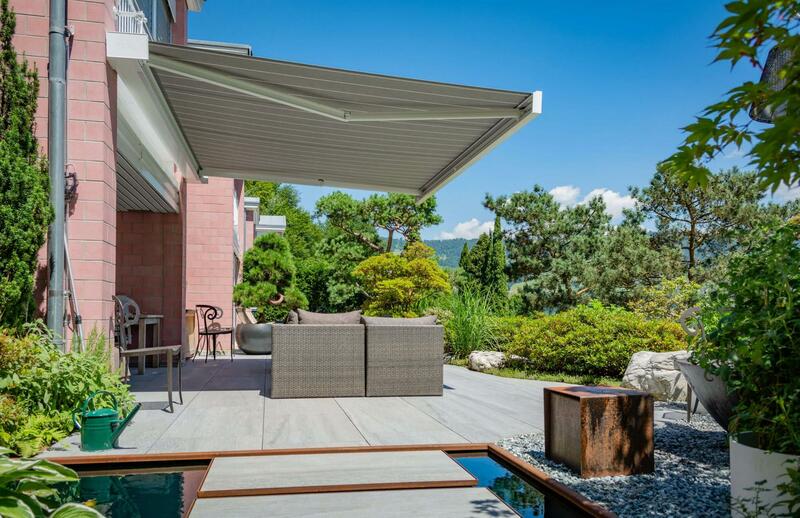 If you also combine the awning with side elements, you can be as flexible as the weather. In addition to a high-quality and weather-resistant model, professional installation is equally important. As classic sun protection for your outdoor seating area or a children's playground, in addition to classic awnings, so-called pergola awnings or glass roofs with integrated folding awnings also offer a perfect solution. High-quality awnings protect against harmful UV rays, prevent year apartment from becoming overheated, and still allow enough light. What kind of sun and weather protection best suits your home should ideally be discussed with an awning specialist on site. They know have a lot of time for you in the Winter and can often provide you with very good offers during this time. Our awning supplier also has a solution for specific requirements - custom-made products included. Do you prefer natural sun protection? Whether for the play area or to cover your pet's favorite spot - a shady tree with a wide crown or screening elements with vine are natural alternatives to awnings, parasols and so on. Closed, half or fully opened, this is what makes the Summer garden principle so attractive for patio owners. The great thing about it: With a Summer Garden system you can transform your patio step by step: One year from now, you can equip your seating area with a glass roof, the next with glass side walls that can be opened and perhaps with a pergola awning for sun protection. The profiles of the Summer Garden are not insulated, the glass is simply processed. A Summer Garden is definitely not designed to actively use the room as a living space during the Winter and to heat it accordingly. But beware: Many municipalities require building permits for permanent roofing. Planning a terrace also means deciding on the building materials at an early stage. Outdoor areas can be made of wood, natural stone, concrete slabs or tiles. Even a simple gravel surface can be attractive. For example, wooden planks have the advantage of not heating up so quickly in the sun. At the same time, they look less harsh than a stone floor and develop an attractive patina over time. In addition to controversial tropical woods, robinia and larch wood have increasingly established themselves as being ecologically sound. The advantage of stone and tile floors is their extreme longevity. Outdoor tiles also offer more flexibility in design, as they are available in a wide range of patterns and colors. In the Winter or when it rains, however, floor tiles should be used with caution: When selecting tiles, make sure they are highly slip-resistant. Whether Mediterranean, purist, playful or farmhouse style - the selection of garden furniture is large and distributed among many suppliers. In principle, patios and other outdoor areas can be designed with garden furniture made of wood, plastic or rattan. What matter is that their look matches your house and garden. When designing a dining area, make sure you have enough seating spaces and a sufficiently large table. Decorations can be used to complete the seating area. Of course, this also includes potted plants in various sizes, colors and designs. They can be cleverly arranged and can also protect you from the curious glances of your neighbors. Garden lighting enhances the beauty of your garden and patio, even in the dark, and also ensures safety. This point is often forgotten when planning a garden or patio. In retrospect, it is then associated with additional effort or higher costs to install wiring and create the necessary infrastructure. Discreetly illuminated focal points create a completely new atmosphere; the play with colors is particularly effective. Whether you want to stage your plants, illuminate the patio harmoniously, highlight individual pieces of furniture or façade parts: Outdoor light has many sides. During the day, lighting systems are almost invisible. Modern lighting systems with twilight switches or remote controls via an app from your smartphone or tablet make handling easy and convenient. reduced prices for sun awnings and weather protection awnings with side panels, as many suppliers offer attractive offers in the off-season. short delivery and assembly times, because Winter is off season and awning suppliers have more capacity. glare protection when the sun is low, because a properly mounted awning also protects living spaces in the Winter. a new open-air room with patio roofing and a stable, weatherproof awning, combined with side panels against the wind on request. Or through a flexible glass solution. When does the sun shine on the garden? Where does much shade fall? Where and how can early morning rays and late evening sun be enjoyed? Tip: Plan two seating areas - one in the east for breakfast and one facing west for the rest of the day. Where can a shady area for long stays in the garden be created? What function should the patio fulfill? Where should I put heavy garden furniture?